This is not your average potato salad! This no mayo potato salad is perfect for picnics and potlucks. 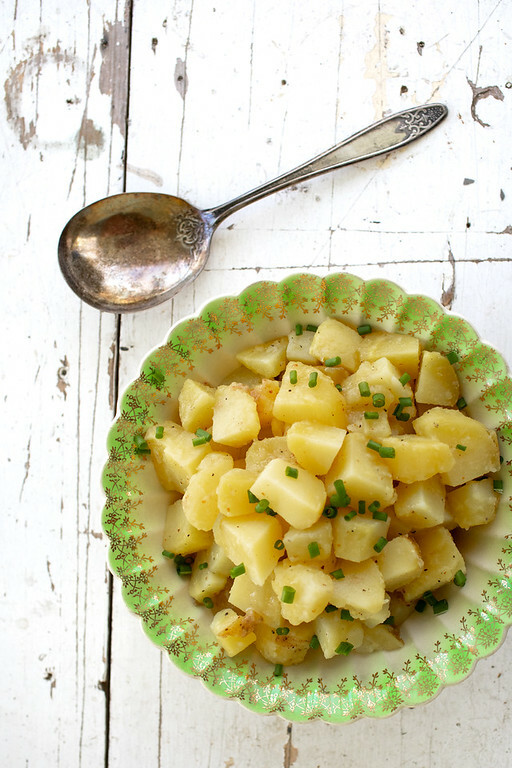 White wine, vinegar, olive oil, and Dijon mustard make a delicious potato salad. Do you like your potato salad, creamy and mustardy, or oil and vinegar-y? I don’t really think I’ve ever met a potato salad that I didn’t love, but I tend to make those with an oil and vinegar base more often than I make a creamy one. I’m not sure why, it just seems to work out that way. I think perhaps it’s because you can alter the flavor of the vinaigrette so easily and totally change the flavor of the potato salad. This French potato salad is a perfect example of a quick and easy and so delicious potato salad! White Wine Vinegar – can use Rice Vinegar for a more subtle flavor. Use waxy potatoes – waxy potatoes (like Yukon Gold, Fingerling or red potatoes) will stay firm and hold their shape better. Start with cold water – this allows the potatoes and the water to heat up together and the potatoes will cook more evenly. Salt the water – just like pasta, you need to season the cooking water of the potatoes. Cook until just tender – depending on the size of the potatoes, start checking them after about 8 minutes of boiling. The tip of knife should feel just the slightest bit of resistance. Dress the potatoes while warm for a vinegar based dressing. The potatoes will absorb the flavors better while warm. 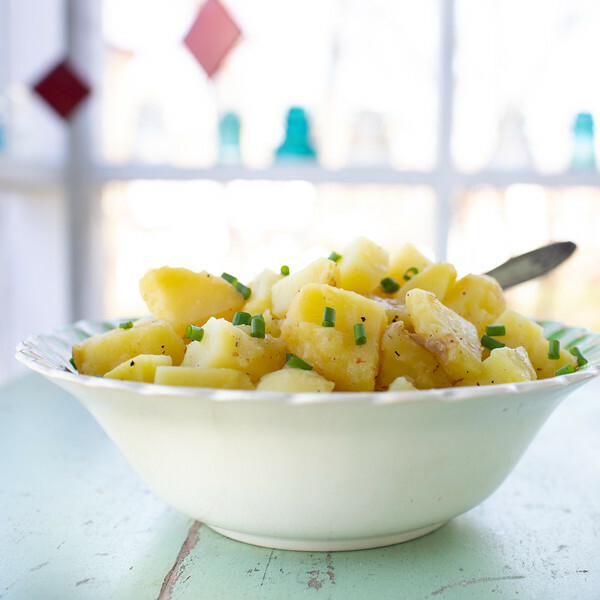 Serve vinegar potato salads at room temperature or warm. Step 1 – If the potatoes are small leave them whole, otherwise cut them in half. Place them in a pan and cover with cool water. Turn the burner to high and bring to a boil. 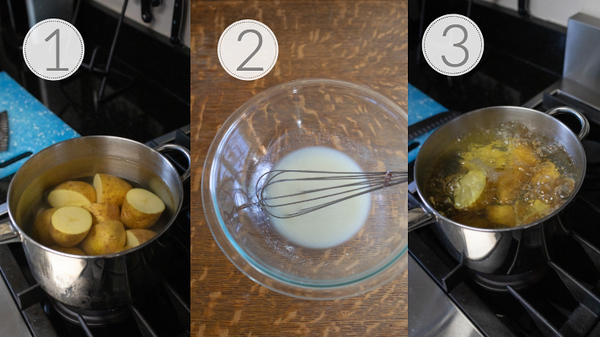 Step 2 – In a large bowl, whisk together the white wine, white wine vinegar, olive oil, and Dijon mustard. Step 3 – after the potatoes come to a boil, start checking them with the tip of a knife at about 8 minutes. Step 4 – when the potatoes are just tender, drain in a colander and rinse with cold water to stop the cooking. 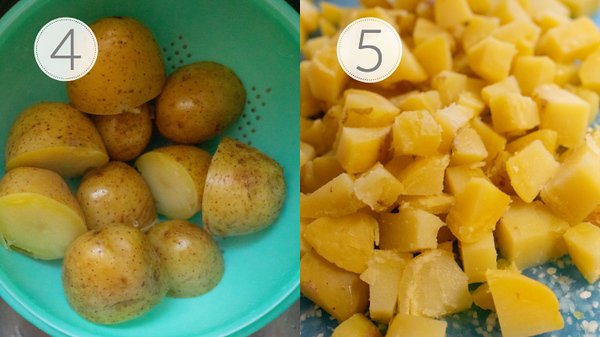 Step 5 – cut the potatoes into bite sized cubes. You can leave the peel on if you like, though it usually slips off while dicing the potatoes. With no eggs or mayo, this potato salad is both vegan and paleo friendly. I’m not following either of those diets, I just happen to love this potato salad! Note that some wines are not vegan – you can read about How to Tell if a Wine is Vegan? This potato salad is a riff on one that I found in a very old Martha Stewart cookbook. What I love about it, besides how good it is, is that it is so easy to modify it. If you’d like to receive an email when a new post goes live on the blog, I’d love it if you signed up for email notification! This is not a chatty news letter (who has time for that?) this just lets you know that a new post is up. Click here to sign up to receive email updates. This simple potato salad is so delicious and easy! 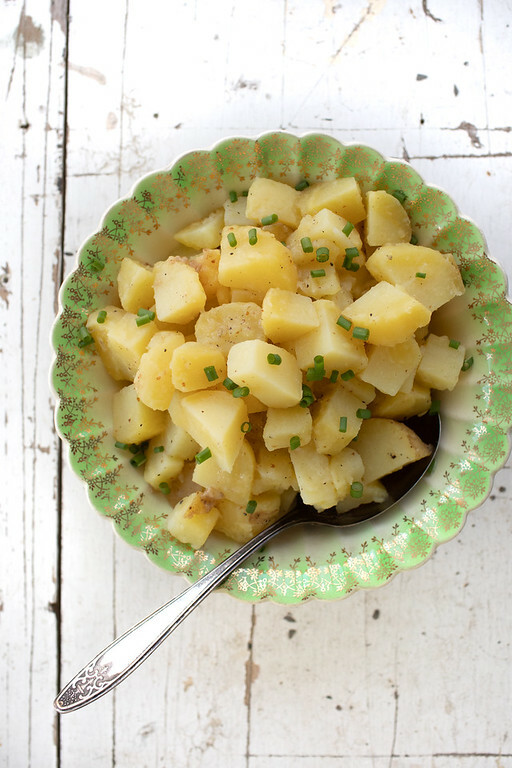 The warm potatoes soak up all the flavor from the tangy white wine and Dijon mustard vinaigrette! Wash the potatoes. If they are large, cut them in half. Place in a pot and cover with cold water. Over high heat, bring to a boil. Boil until just tender when pierced with a knife. Drain. While potatoes are boiling, in a large bowl, whisk together the white wine, vinegar, olive oil, Dijon mustard and salt and pepper. Add warm potatoes to dressing in bowl and toss. Add more salt and pepper to taste. Can garnish with fresh chopped herbs. Use waxy potatoes - waxy potatoes (like Yukon Gold, Fingerling or red potatoes) will stay firm and hold their shape better. Start with cold water - this allows the potatoes and the water to heat up together and the potatoes will cook more evenly. Salt the water - just like pasta, you need to season the cooking water of the potatoes. Cook until just tender - depending on the size of the potatoes, start checking them after about 8 minutes of boiling. The tip of knife should feel just the slightest bit of resistance. oh I have had this before and loved it but totally forgot about it, thank you for the reminder!! Me too! I pulled this from the archives and made it again! Oh, I hope he likes it! I actually prefer it over the heavy may and egg kind! I love how simple and easy this potato salad sounds. I need to try it with the wine and the dijon mustard. Thanks. This is a new kind of potato salad for me as I have always have the ones with mayo in them, not that there’s anything wrong haha. But this potato salad recipe sounds very delicious, and just right for when I need a lighter salad. I really do prefer it over the mayo ones, it’s so light. I love all potato salads, but lean more towards the dry vinegar style and especially this one. They just taste lighter! I lean towards them too! I love their lighter flavor! This salad is perfect for all the Easter parties and gatherings! Oh, it would be perfect! I love potatoes and they are all the time in my kitchen. Yummy salad, great for luncheon! Yes, it would be great for a luncheon! In answer to your question, I love potato salads that are non-creamy, but rather are made with an oil/vinegar or yogurtish mixture. This sounds great, and I love the addition of white wine! Beautiful blog! I love Potato salad and that looks so good. I may have to make some this weekend. This potato salad sounds good. I don’t make potato salads nearly often enough. Pam, I love potato salad but have never tried it warm – yum! I have a weakness for potato salad… I have never met one I don’t just love. Lovely, simple and the only thing I would add is a snippet of chives.